130 kilo meter drive to Ramechhap from Kathmandu valley takes you to the newly discovered and off the beaten track“Indigenous Peoples Trail” which is located in Mahabharat mountain range offer the visitor with its unique, living, exposure to one of the most culturally diverse areas of Nepal. The ‘Indigenous Peoples Trail’ offers scenic trekking at comparatively low altitude, below 3126 meter. Bound by Thulo Sailung peak in the North, the golden Sun Koshi flowing along the South and the Tama Koshi in the East, the ‘Indigenous Peoples Trail’ presents an incomparable and natural blend of cultural, linguistic and ethnic diversity coupled with breathtaking panoramic view of 400km Himalayan and Mid Hills including Annapurna, Manaslu, Ganesh Himala, Langtang, Jugal Rowling, Numbur Peak, Dhaulagiri, Everest and kanchunja Ranges. The highlights of Indigenous people trail trekking is the cultural diversity of different ethnic groups living in that region like, Newars, Tamang Sherpa, Thamis, and Majhis etc. You can experience different tradition, culture and lifestyles of people can be closely. People following Hinduism and Buddhism with the variety of gods and goddess, temples, stupas and monasteries are also found in the Indigenous People trail trek. Far from city area, this trail rewards home stay in the local houses of local people and enjoy their traditional way of living. You will enjoy folk dances and songs performed by local people wearing their traditional colorful dresses. You will get engaged with the activities of local people like cooking, attending traditional marriage ceremony etc. Indigenous people trail trek offers you to learn different countryside tradition and get involved in these traditions of Nepal. Wilderness Excursion’s carefully designed 11 days Indigenous people trail trekking package, number of days can be customized according to your convenience. We will provide you an experienced guide who will take you to the countryside far from Kathmandu city to make you experience the real and undiscovered Nepal and Nepalese people, their tradition, their culture. You will observe the urban area and people in Nepal so closely and Incredible Himalayan Sherpa adventure offers you Indigenous people trail trekking trips package in a very good price. This trek is perfect for everyone and more suitable for those people who want to know the culture and tradition of Indigenous people of Nepal. Fantastic trip to the remote indigenous people area. Expereince the different ethnic group, homestay in local houses. Unique cultural, involve in working cooking, interact with with locals. Observe the breathtaking panoramic view of Himalayan giant. Day 01: Drive to Dhunge from Kathmandu and trek to Sailung (Khola Kharka) 2950m. Day 02: Explore to Thulo Sailung & Rajveer Environs. Day 03: Trek to Surkey (1840m), 5 hours. Day 04: Trek to Doramba (2055m), 4 hours. Day 05: Trek to Khandadevi (2000m), 5 hours. Day 06: Trek to Hiledevi/Dongme (1980m), 4 hours. Day 07: Trek to Lubughat (820m), 4 hours. Day 08: Drive to Kathmandu via Dhulikhel. Day 01 :Drive to Dhunge from Kathmandu and trek to Sailung (Khola Kharka) 2950m. Drive from Kathmandu to Mudhe and then to Dhunge Village which takes about 5 hours of driving. From Dhunge, it is a short 90-minute climb to Sailung hilltop. 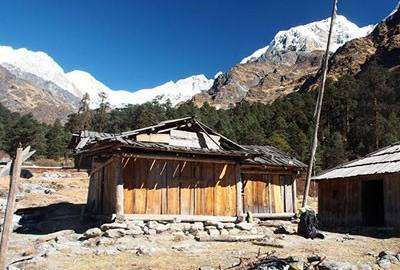 Following the short trail down to the Sherpa village of Khola Kharka you will spend the night in the newly established Khola Kharka Community Lodge run by local Sherpa and Tamang people. Overnight at Homestay. Day 02 :Explore to Thulo Sailung & Rajveer Environs. Morning after breakfast, you walk to Sailung at the altitude of 3,146 meters which offers resplendent views of the Annapurna, Manalsu, Ganesh Himal, Langtang, Dorje-Lhakpa, Rowaling, Everest and Kanchenjunga mountain ranges. The hillside village of Thulo Sailung is regarded by the Tamangs as home to their deity, Sailung Phoi Sibda Karpo, or “White Male Lord of the Earth.” Get an insight into their ancient ancestry and role as former border patrollers. Overnight at Homestay. Day 03 :Trek to Surkey (1840m), 5 hours. Today’s tour descend Sailung Forest for Surkey Village where you will be invited to receive a blessing from the Lamas at Rajveer Monastery. Along the route you will pass through a Sherpa village and a Tamang village, each with their own Buddhist Gompas. Prayer flags, chortens and mani stones are scattered along the route. Native trees and birds will demand your attention. The trail continues to the spectacular 40-foot Thinghare Waterfall, then on to the beautifully terraced settlement of Surke. You will spend the night in one of five newly renovated Newari Homestays and visit the endangered Thami Community. A local Thami band will be on hand to entertain and visitors can sample the local Raksi, a traditional alcoholic drink. Overnight at Homestay. Day 04 :Trek to Doramba (2055m), 4 hours. Experience the Thami cultural programme at Tinghare village before taking lunch at Deurali. You will trek through the Doramba Valley, where the trail traverses along forested hillsides to the terraced fields of Doramba. It is a leisurely hike that follows the contours of the valley, leading to the bustling Doramba Bazaar, where you can purchase cold drinks, snacks and music cassettes of a local Tamang singer, Shashi Moktan. Doramba is one of the largest Tamang settlements in Nepal and most of the Thangka painters found in Bhaktapur and Bouddha are originally from this remote village. Enjoy a superb evening of cultural performances before your overnight rest in a Tamang Home-stay. Overnight at Homestay. Day 05 :Trek to Khandadevi (2000m), 5 hours. Leaving the Doramba valley, the route ascends to the sacred Hindu shrine of Agleshwari Danda, where you will be rewarded with stunning views of the Himalayas and the rolling Mahabharat hills below. Descend through a local slate mine, past pine forests and emerge at Galpa Bazaar. This bustling center is an ideal place to break for lunch. In the afternoon you will visit Khandadevi Temple, perched on top of a 1,985-meter (6,512-foot) peak and encircled by ancient stone walls. Dedicated to the Goddess Khada Devi, it was discovered in 1458 AD by a shepherd who saw milk oozing from a sacred stone, said to be an emanation of the Goddess. Overnight at Homestay. Day 06 :Trek to Hiledevi/Dongme (1980m), 4 hours. Rise before dawn to catch the sunrise as you trek towards Hiledevi. The trail navigates through thick and hilly pine forest. You will encounter birds and mammals, as well as the enormous rock that is adorned with an image of Shiva, before emerging at Dhonghme, an ancient Yolmo settlement. In the evening, you will climb to the summit of Sunapati. Here, amongst the Buddhist Chortens, you will enjoy a spectacular sunset over the Himalayas, before returning to the monastery lodge for an evening of Yolmo culture. Overnight at Homestay. Day 07 :Trek to Lubughat (820m), 4 hours. After another magnificent sunrise, descend to the village of Lubughat on the golden Koshi River. You will be walk along one of the newly renovated Eco trails to reach the Sunapati hilltop. In Lubughat you will meet the Majhi people, renowned for their fishing expertise. You will be invited to join them on a Majhi fishing adventure and barbecue, followed by a cultural demonstration. Overnight at Homestay. Day 08 :Drive to Kathmandu via Dhulikhel. A 45-minute walk through the valley brings you to Nepalthowk where you will catch our private land cruiser for the return drive to Kathmandu which takes 5 hours and transfer to Hotel. Lodge and homestay accommodation on sharing basis. Necessary trekking permit & TIMS Card (Trekker's Information System).